Oxnard Fire Department has teamed up with ABC 7 and Southern California firefighters to support the 26th Annual Spark of Love Toy Drive. Now through Christmas Eve, bring a new, unwrapped toy or sports equipment to any Oxnard fire station to be donated to local children and teens. In the last two and a half decades, Spark of Love has successfully collected more than nine and a half million toys for underserved children and teens in Los Angeles, San Bernardino, Orange, Ventura and Riverside counties. Starting in 2016, the Southern California Spark of Love toy drive partnered with the U.S. Marine Corps Reserve Toys for Tots program. This nationwide program has been collecting and distributing toys since 1947. The Oxnard Fire Department will be collecting new, unwrapped toys for deserving families within our community. The Spark of Love Toy Drive will run from November 17 to December 24, 2018. Collection sites will include all Oxnard Fire Stations, Fire Administration Office, Oxnard Public Libraries and some local Wal-Mart. All toy donations are distributed locally by Children’s Services Auxiliary of Ventura County. Drop off new, unwrapped toys or sports equipment at any local fire station. Donate to Children’s Services Auxiliary of Ventura County via check or online donation at www.csavc.org/donate.html. All proceeds will go towards buying toys or sports equipment for local children. Those wishing to make a monetary donation, please make checks payable to CSA, tax-exempt #77-0054936. 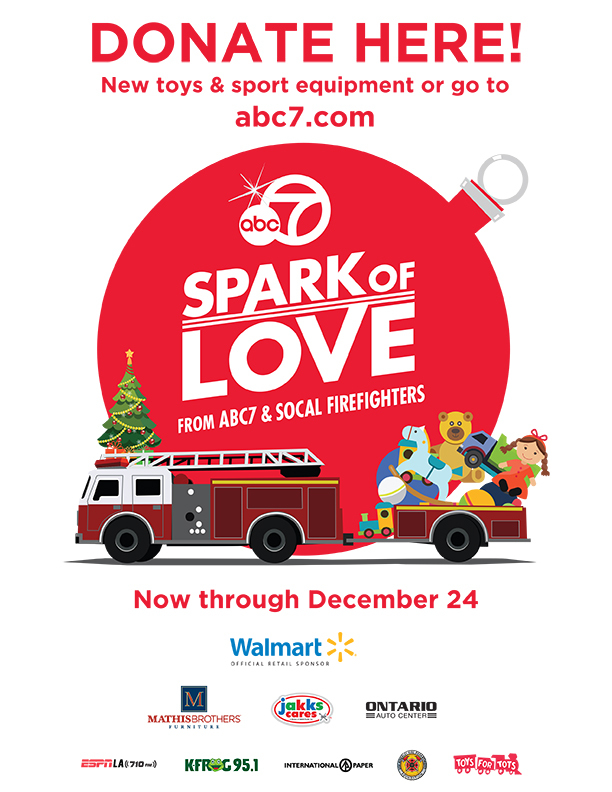 The Spark of Love is a partnership between ABC7 and fire departments across southern California. Over the past years, the Spark of Love Toy Drive has successfully collected more than ten million toys for underserved children and teens. The “Spark of Love Toy Drive” takes place in November and December every year. With love and support of donors and sponsors, kids across Southern California receive a new toy each holiday season.